Patrick Comerford: Celtic Spirituality: Our Heritage? Last Sunday, I was speaking in Saint Lachtain’s Church in Freshford, Co Kilkenny. There I asked why, as part of our heritage, the Church of Ireland has inherited so many churches with the names of saints that are unpronounceable or with so many letters ‘H’ in them when we find it so difficult to pronounce the letter ‘H’ in Ireland. Saint Lachtain and Saint Doulagh are among the easier saints’ names to pronounce. Apart from Christ Church Cathedral, there were six other parish churches within the walls of the old city of Dublin. These were dedicated to Saint Michael (High Street), Saint Olave (Baker Street, a site unknown south of Wood Quay, but probably at the Lower end of Fishamble Street, at the top of a lane running to Wood Quay), Saint John the Evangelist (Fishamble Street), Saint Mary la Dame (near the site of the present City Hall), Saint Martin (which later was dedicated to Saint Werburgh, the patron saint of Chester) and Saint Nicholas. Saint Michan’s was outside the city walls, in Oxmantown; Saint Audeon’s, named after Saint Ouen or Audoenus, was not founded until about 1190; while Saint Andrew’s is a little later. Notice how among those six there is not one Gaelic name, and there is no dedication to Saint Patrick either. But those names parallel many of the Viking names in other walled cities or towns of the time, such as Wexford and Waterford, including Christ Church, Saint Olav, Saint Mary, Saint Michael, and so on. For example, there were five intramural parishes in Wexford town, dedicated to Saint Doologue, Saint Mary, Saint Iberius, Saint Patrick, and Selskar (Saint Peter and Saint Paul, and not, as tradition claims, Holy Sepulchre). The use of apostles’ names, or the name of great saints such as Nicholas, the patron of mariners, marks Viking churches, with Christ Church or Holy Trinity being the principal church in the Viking naming system. The unpronounceable saint’s names, with plenty of ‘Hs’, were left to the Gaelic Irish or Celtic settlements – with the exception of Saint Bride or Bridget, and, sometimes, Saint Patrick. Saint Doologue’s Parish in Wexford stretched to a mere 2 ha in land area, and was once listed in Ripley’s Believe It or Not as the smallest parish in the world. It was also known as Saint Olave’s. Dating from about 1035-1060, it can be traced out at the end of South Main Street, between Stonebridge and the Talbot Hotel, on the low-lying ground between Wexford Castle (the present army barracks) and the Bishopswater stream. Despite its size, this parish contained within its boundaries two churches: Holy Trinity, at the foot of the castle, and Saint Doologue’s, which probably stood at the present junction of Lower King Street and Barrack Street. Saint Doologue’s in Wexford is one of only three instances of this dedication for a church in Ireland: the others are Saint Doulagh’s or Saint Olave’s on Wood Quay in Viking Dublin, and Saint Doulagh’s here in Balgriffin. The patrons of Saint Doologue’s or Saint Olave’s near Wood Quay were the Augustinians in Bristol, just as the Augustinian Prior of Christ Church Cathedral held Saint Doulagh’s in Balgrriffin from 1038. This arrangement in the city centre continued until at least 1540, if not 1570, when the parish was incorporated into Saint John’s in Fishamble Street. According to Stanihurst and Harris, Saint Olave’s in Dublin was also known as Saint Tullock’s or Saint Doulagh’s. But the church, like many churches of the same name, was dedicated, not to a Celtic saint, but to Saint Olafe or Saint Olaf, King of Norway, who was killed in 1030. Almost 200 years ago, WH Mason was calling this church Saint Olaf’s, so there are a number of points where the name of Saint Doulagh (in its various spellings) and Saint Olaf overlap – in Waterford, Wexford, Dublin and Fingal – all areas with Viking rulers and strong Viking culture. Indeed, Mason points out that, just as within the walled city of Viking Dublin, there are few if any churches in Fingal with Irish dedications. We can point to Holmpatrick in Skerries, Saint Columba’s in Swords and Saint Patrick’s in Donabate, but these are exceptions. The overlap between dedications to Saint Olave and Saint Doologue shows how over the centuries we have sought to reconcile our Viking Church heritage with our Celtic Church heritage, but usually at the expense of our Viking Christian heritage, neglecting and forgetting the names associated with the very people who gave a unique identity to Fingal. It is as though there is only one spirituality that ought to be acknowledges as our Spiritual Heritage, namely Celtic Spirituality. If you look at the shelves of our bookshops or the shelves of shops in our airport departure lounges, the greatest number of books in the area of spirituality falls into three categories: Buddhist spirituality, Angels and Celtic spirituality. I cannot speak for the first category. But the other two, I can confidently say, are genuinely shallow and lacking in both theological and historical depth. So, is there such a thing as Celtic Spirituality? Was Saint Patrick the source of the Christianity that made this island the “Island of Saints and Scholars”? This evening, I would like to invite us to look at the origins of Christianity in Ireland, including the arrival of Saint Patrick and the development of the “Celtic Church” – if there ever was such a thing, and at how this has shaped and influenced – or at least contributed to, the current, shared identity of Christianity in Ireland. Traditionally and romantically, Saint Patrick is said to have converted the entire population of Ireland from paganism in a very short period between 432 and 461, less than the span of one generation. But there were Christians in Ireland before Saint Patrick’s arrival and his work as a missionary is only part of the story of the origins and growth of Christianity on this island. A hint of this is already found in the way Irish mythology was long anxious to claim Irish connections with the Christian story that predate Patrick and date back even to Biblical times. 4, Accounts of Mansuetus, said to have been an Irish bishop in 4th century France. But there is a realistic medium between these legends and the concept of a sudden conversion to Christianity at the hands of a single missionary. The seas provided Ireland with immediate access to the neighbouring islands and Continental Europe: Wales was less than a day away from the coast near here; the north Antrim coast and Galloway were a few hours apart, many parts of Continental Europe were accessible in a day or two by sail and ship; present-day Spain was no less than three days away; Iceland was 1,000 miles and less than a week away. The “Celtic” people in Ireland were traders, raiders and plunderers, and there is evidence of Roman traders reaching Irish harbours and beyond them up rivers such as the Nore and the Barrow, trading in wine, oil and wheat. The Irish imported pottery, metalwork and bric-a-brac from Roman Gaul and Britain, and exported copper, gold, slaves, hides, cattle and wolfhounds. By the end of the third century, people from Ireland were establishing colonies in north-west and south-west Wales, Cornwall and the west coast of Scotland. There must have been interchange between these colonists, Christian Britons and the Roman ruling and military classes. Nor can all the traffic have been one-way; the return traffic must have brought some Christians to coastal Ireland. By the third or fourth century, there was regular commercial, mercantile and social contact between Ireland and Roman communities in Britain and Gaul. There have been abundant finds of looted Roman coins all along the northern and eastern coasts of Ireland: at the Giant’s Causeway (1831), Coleraine (1854) and more recently at Limavaddy; and Roman silver ingots with similar Christian provenance have been found in Kent and Limerick. Catherine Swift argues convincingly that many among the ruling class in Ireland adopted the cultural habits and social customs of Roman Britons, to the point that they became Romanised, even in their religious fashions, and what is now the Cathedral Hill in Armagh is an example of one of their temple sites. Christianity probably arrived in Ireland in the fourth and early fifth centuries by a slow and gradual process of unplanned infiltration, from Britain and Continental Europe. Niall of the Nine Hostages, commanded several raiding expeditions across the Irish Sea. British captives carried off by Irish raiders may have been yet another way of Christianity gaining a presence on this island. Some educated continental Christians may also have sought refuge in Ireland during the barbarian invasions of the crumbling Roman Empire, fleeing Gaul (present-day France) at the start of the fourth century, and bringing Christianity with them. Other points of contact include the contacts made by the Irish émigrés in Britain, and trade links with Roman Britain, Gaul and Spain. A gravestone for a fifth century Irish Christian predating the mission of Saint Patrick has been found in a Christian cemetery in Trier, and fifth century Christians, some with Latin names, are commemorated on ogham stones in southern Ireland, in Carlow, Waterford, Cork and Kerry. In other words, many factors indicate the arrival of Christianity in Ireland long before Patrick was captured as a slave, and there was a considerable Christian presence on this island before Patrick began his mission in 432. There is some evidence that suggests the gradual conversion of Ireland by Britons in the fourth century and possibly early fifth century. There are traditions that some Irish saints predated Saint Patrick: Ciaran of Seirkieran (Diocese of Ossory); Declan of Ardmore, Co Waterford; Ibar of Begerin, Co Wexford; Ailbe of Emly, Co Tipperary; Meltioc (Multose) of Kinsale, Co Cork; and so on. Although there is no evidence to support these largely unreliable traditions, it is worth noting that most of these are associated with the south and the south-east. And the presence of British Christians in Ireland must have had an influence, direct or indirect, on the spread of Christianity in Ireland long before 431. By the time Patrick began his mission, he would have found the British Christians resident in Ireland forming the nucleus for his mission and his Church. The background to Saint Patrick’s mission includes the presence of perhaps three heresies in Ireland – Arianism, Priscillianism and Pelagianism – that probably arrived from western Europe in the late fourth and early fifth centuries. Some of Priscillian’s ascetic adherents may have made their way to Ireland after he was executed in 386. Pelagius (355-425) was vilified by Saint Jerome as a “most stupid fellow, heavy with Irish porridge,” and claims that Pelagius, or his companion Coelestius, had “his lineage of the Irish race, from the neighbourhood of the Britons.” Perhaps Jerome was insulting his opponent; but, nevertheless, it is possible that Pelagius had lived in Ireland or had Irish ancestry. Germanus of Auxerre was sent from Rome to Britain in 429 to combat the influence of Pelagius and Pelagianism on the Church in Roman Britain. Soon after – perhaps in 431 – Palladius was ordained by Pope Celestine and was sent as the “first bishop” on a mission to “the Scotti [Irish] who believe in Christ.” So, we know that from at least the third decade of the fifth century Irish Christians were numerically large enough to have a bishop sent from Rome, and Palladius is associated with a number of church sites in Leinster. Palladius may have worked in the south-east of Ireland for a few years. His work in Leinster was continued, perhaps, by figures such as Secundinus, Auxilius and Iserninus. His mission activities and those of Patrick may have been confused in later writings, so that much of the work and success of Palladius was attributed wrongly to Patrick. The young Patrick was captured in a great raid along with “many thousands of people” [Confessio 1], some of whom were lukewarm Christians, according to his own account; some of them could also have been committed Christians, perhaps even priests. Saint Patrick’s account of his flight from slavery as a young man at the age of 22 may be evidence of an escape network for fugitive slaves run by concerned Christians, presumably in Leinster, more than 20 years before Patrick began his own mission [Confessio 17 and 18]. However, Patrick does not refer to Palladius. Although the missions of Palladius and Patrick may have coincided, Patrick was working in fresh territory, while Roman missionaries in Leinster were consolidating the work of Palladius and others who, by 431, had ensured that there were many people in Ireland who were Christians. By the time Patrick began his mission, the foundations had been laid for a Church in Ireland that over the centuries that followed became a vibrant missionary Church. In his Confessio , Patrick shows he is aware of episcopal activity in other parts of Ireland, with baptisms, confirmations and ordinations. Patrick says he travelled to places in Ireland “where no one else had ever penetrated, in order to baptise, or to ordain clergy, or to confirm the people” – suggesting there were places that had received episcopal ministry from other, earlier sources. So, Christianity had already taken root in the island before Saint Patrick began his mission. The traditional account of the life of Saint Patrick says he was born about 372 in Roman Britain in Bannavem Taburniae, perhaps in Cumbria or at Dumbarton in Scotland. He says his father Calpornius was a deacon and his grandfather Potitus was a priest; both were from a relatively prosperous class of Romans. At the age of 16, he was captured and brought to Ireland and later sold as a slave. After escaping and returning to his own people, he began to have visions of the cry of the Irish pleading to him to come back – an image probably drawn from Saint Paul’s vision in Troy of a man calling him across the sea to Macedonia (see Acts 16: 9-10). Believing he was called by God to a mission to the Irish, Patrick entered the monastery of Saint Martin of Tours. He was subsequently ordained a bishop in Rome, and was sent to Ireland by Pope Celestine, who died in 432. Patrick arrived from Britain in Ireland around 432, and most of the details we have of his life are from his Confessio, written in reply to the attacks on his character brought against him in England, and his Letter to Coroticus. It is said that Saint Patrick built 365 churches and consecrated an equal number of bishops, established schools and convents, and held synods. The number alone indicates the mythological nature of this account – 365, as the number of days in the year, represents figuratively, rather than literally, the completion of a task. The sites associated with Patrick include Armagh, which became the centre of the cult of Saint Patrick, Croagh Patrick in Co Mayo and Lough Derg on the borders of Co Donegal, where he is said to have spent time in retreat, and Downpatrick, where he is said to have been buried. There is no historical reason to associate him with the site of Saint Patrick’s Cathedral in Dublin, or the supposed Saint Patrick’s Well at the Nassau Street side of Trinity College Dublin, or other sites such as Holmpatrick in Skerries or Saint Patrick’s Church in Donabate, both in Fingal. There are four different dates for his death. Most traditions say he died around 460, although other authorities say he died sometime around 491 to 493. Mediaeval sources are unanimous in describing Saint Brigid of Kildare as a contemporary of Saint Patrick. There is a theory that there were two Patricks, although this may arise from a misreading of “the elder Patrick,” who died in 457, where elder might also be read as bishop or priest. Neither the canons attributed to him nor the Breastplate of Saint Patrick is his work. Later seventh-century documents speak of Patrick as the successor of Palladius. However, the O Neill dynasty had Tireachan and Muirchu write spurious accounts of Patrick’s life to establish Armagh’s claims to a primacy in Ireland. When Brian Ború became High King ca 1000 AD, he had his secretary write into the Book of Armagh a confirmation of the right of Armagh to all church revenues in Ireland. It was at least another century, however, before Armagh’s claims to primacy were recognised throughout the Irish Church. Is there a distinctive Celtic Christianity? Is there such a thing as ‘Celtic Christianity’ or a ‘Celtic Church’? Was there ever a distinctive Celtic Christianity? During the late fifth and sixth centuries, the monasteries became the most important centres of Irish Christianity, including Armagh which claimed its origins in the labours of Saint Patrick, and Clonard, which is associated with work of Saint Finnian of Clonard, who is said to have trained the “Twelve Apostles of Ireland” at his abbey in the Midlands. The great monasteries included places such as Kells, Glendalough, Clonmacnoise, Durrow, Bangor, Ferns, Tallaght and Finglas. Monasticism in these islands developed with particular characteristics that are unique, so that for a long time true ecclesiastical authority lay not with bishops but with the abbots of monasteries. Following the growth of the monastic movement in the sixth centuries, abbots controlled not only individual monasteries, but also expansive estates and the secular communities that tended them. Abbots were not necessarily ordained and many were members of an hereditary caste within noble or royal families. This focus on the monastery means the monastic system came to be the dominant ecclesiastical structure in the Irish Church, and the network of monasteries attached to an abbey, rather than the diocese, was the dominant administrative unit of the church. Bishops had sacramental roles and spiritual authority, but appear to have exercised little ecclesiastical authority in the way that bishops did in continental diocesan structures modelled on the Roman administrative system. The monastic system In Ireland became increasingly secularised from the eighth century on, with the monasteries even making war on each other or taking part in secular wars. For example, 200 monks from Durrow Abbey are said to have been killed when they were defeated by the monks of Clonmacnoise in 764. A reforming monastic movement emerged in the Ceilí Dé, who were associated particularly with the monasteries in Tallaght and Finglas. In the sixth and seventh centuries, Irish monks established monastic foundations in what we now call Scotland – think of Saint Columba (ca 521-597) or Saint Colmcille in Kells and Iona, and in Continental Europe, especially in Gaul – think of Saint Columbanus. Columba is associated with the foundation of abbeys at Swords in Fingal, Kells, Co Meath, and Durrow, Co Laois. However, he was held partly responsible for the Battle of Cúl Drebene (561) and was sent into exile. In 563, he founded the monastery of Iona which became one of the major centres of Irish missionary activity in Scotland and northern England. Monks from Iona, under Saint Aidan (died 651), founded the See of Lindisfarne in Anglo-Saxon Northumbria in 635. Aidan was sent from Iona at the request of King Oswald of Northumbria, and the influences of his monks and disciples spread from Lindisfarne throughout northern England and into the Midlands. The English historian Bede (ca 673-735) implies that Irish missionary activity in northern England was more successful at converting the English than the mission started from Canterbury in southern England that began with Saint Augustine in 597. Irish monks also founded monasteries across the continent, exerting influence greater than many more ancient continental centres. Saint Columbanus, a monk from Bangor in Co Down, left Ireland in 590 on a perpetual pilgrimage and moved to Gaul, where he founded monasteries in Annegray and Luxeuil. His fervour and his emphasis on private penance brought new spiritual energy to an area where Christianity was at a low ebb. However, the observance of Irish customs led to the expulsion of Columbanus and his companions from Gaul in 610, and they eventually settled in Bobbio in what is today northern Italy. 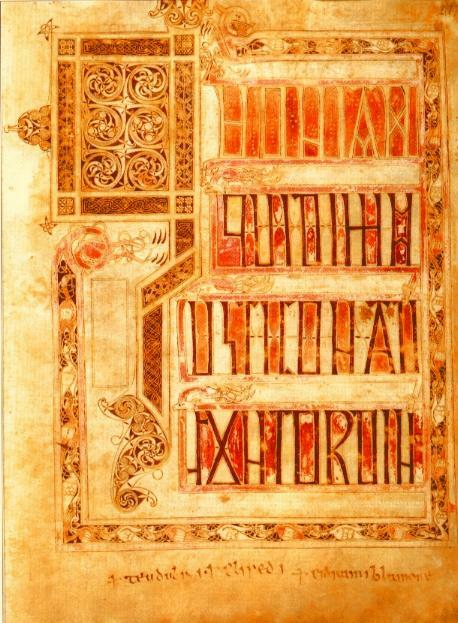 He died in 615; his surviving works include letters, sermons, a penitential and rules for monastic and community life. Saint Gall, a disciple of Saint Columbanus, followed him to Italy in 612. However, Gall remained in what is now Switzerland, where he lived the life of a hermit until his death around 650. The monastery of St Gallen, which takes its name from him, was founded ca 719 on the site of his hermitage. Pope Honorius I issued a papal privilege to Bobbio Abbey, granting it freedom from episcopal oversight. Many of the monasteries of the Irish missions adopted the Rule of Saint Columbanus, which was stricter than the Rule of Saint Benedict, which was prevalent across western Europe. This rule involved more fasting and included corporal punishment. However, it eventually gave way to the Rule of Saint Benedict by the 8th or 9th centuries. Irish scholars who had considerable influence in the Frankish court include John Scotus Eriugena (died ca 877), one of the founders of scholasticism and one the outstanding philosophers of the day. The customs and traditions particular to Insular Christianity became a matter of dispute with the wider, Western Church. The most notable dispute was over the proper calculation of the date of Easter. The insular churches shared a method of dating Easter that was distinct from the system used on the Continent. Calculating the date of Easter is a complicated process involving both the solar and the lunar calendars. Irish and insular Christianity used a calculation table similar to that approved by Saint Jerome. However, by the sixth and seventh centuries, it had become obsolete and had been replaced, and the divergence emerged. The first differences over these calculations surfaced in Gaul in 602, when Saint Columbanus resisted pressure from the local bishops to conform to the new calculation. Most groups, including the southern Irish, accepted the new tables with relatively little difficulty. At the Synod of Mag Léne around 630, the southern Irish accepted the common Easter calculation, Northumbria at the Synod of Whitby in 664, the northern Irish at the Council of Birr around 697, East Devon, Somerset and Wessex, 705, and the Picts in 710. However, the monks of Iona and their associated monasteries raised significant objections, and Iona did not change its practice until 718. Strathclyde followed in 721, North Wales in 768, South Wales in 777, and parts of Cornwall not until 909. In Ireland, free men had long hair, and slaves had shaven heads. However, all monks, and perhaps most of the clergy, had a distinct tonsure or method of cutting their hair, as a mark of distinction. The prevailing Roman tonsure was a shaved circle at the top of the head, leaving a halo of hair or corona this was eventually associated with the imagery of Christ’s Crown of Thorns. In antiquity, penance had been a public ritual. A distinctive form of penance developed In Ireland, where confession was made privately to a priest, under the seal of secrecy, and where penance was given privately and ordinarily performed privately as well. Handbooks or “penitentials” were designed as a guide for confessors and as a means of regularising the penance given for each particular sin. For some sins, penitents took their place in a separate part of the church during the liturgy, perhaps wearing sackcloth and ashes and took part in some form of general confession. This public penance may have followed a private confession to a bishop or priest. For some sins, private penance was allowed, but penance and reconciliation was usually a public rite that ended with absolution. The Irish penitential practice spread throughout Continental Europe, where the form of public penance had fallen into disuse. Saint Columbanus was credited with introducing the “medicines of penance”, to Gaul. Although the Irish practice met resistance, by the beginning of the 13th century it had become the norm, and this uniquely Irish penitential system was adopted as a practice of the Western Church at the Fourth Lateran Council in 1215, with a canonical statute requiring confession at least once a year. A fourth distinctive tradition in the early Irish Church, and one connected with the penitentials, was the concept of peregrinatio pro Christo, or “exile for Christ.” The concept of peregrination in Roman Law refers to living or sojourning away from one’s homeland. It was later used by early Church Fathers, including Saint Augustine of Hippo, who wrote that Christians should live a life of peregrination in the material world while awaiting the Kingdom of God. But the idea had two additional unique meanings in Celtic countries. The penitentials prescribed permanent or temporary exile as penance for some sins. But there was also a tradition of voluntary peregrinatio pro Christo, which involved permanently leaving home and putting oneself entirely in God’s hands. Many of these exiles became missionaries, including Saint Columba and Saint Columbanus. There were other distinctive traditions and practices. Bede implies a baptismal rite that was at variance with the Roman practice, perhaps with some difference in the rite of confirmation. But were these differences any greater than, for example, the differences that separated Roman and Byzantine Christianity? Many of the myths surrounding the life of Saint Patrick may have been created to support the claims of Armagh to primacy. Many of the myths about pre-Patrician Christianity may have been created to challenge that primacy. But, while Christianity in Ireland predates Patrick, the Patrician mission, in whatever form it came, consolidated Christian presence in Ireland. And Christianity in Ireland – and in Britain – brought new life to Christianity on Continental Europe after the collapse of the Roman Ireland. Did other identities also shape the identity of the Church of Ireland? On the other hand, Celtic Christianity was not exclusively Irish and Irish Christianity was never exclusively Celtic. A recent exhibition in Lichfield Cathedral of the treasures found in the ‘Anglo-Saxon’ or ‘Staffordshire Hoard’ shows intricately-worked ecclesiastical and civilian objects that illustrate the inseparable and intimate inter-connection between the Celtic and Saxon worlds. And that story cannot be separated from the later arrivals: the Vikings, the Anglo-Normans, their English-speaking successors, the Ulster Scots, the French-speaking Huguenots, and so on, to our present-day new arrivals and immigrants. For example, the Vikings brought positive change to the Church in Ireland, and the establishment of towns and cities such as Dublin, settled in 841, Waterford and Limerick opened the way for change. In 943, the future King Olaf of Dublin was baptised in England, and later retired to Iona. The Norse city dwellers in Ireland became Christians by around the early 11th century. In 1028, King Sitric the Silkenbeard of Dublin made a pilgrimage to Rome, and Christ Church Cathedral was founded soon afterwards, perhaps around 1030 and certainly before he was deposed in 1036. The first Bishop of Dublin, Dúnán, was appointed in 1030, and the bishops of the Norse cities initially looked to the Archbishops of Canterbury in their loyalty. The diocesan structures as we know them today only date from the Synod of Rath Breasil (1111), and the Synod of Kells in Co Meath (1152), when the Archbishop of Armagh became Primate and the Diocese of Dublin was incorporated in the structures of the Irish Church. This site is also a continuing visible, tangible example of how Celtic Christianity and Continental Christianity interacted with each other; rather than being mutually exclusive, they had shared and reciprocal experiences. The eight-sided baptistery to the north of the church, in the next field, shows the influence of continental Christianity on Christianity in Ireland. This octagonal baptistery is the only surviving detached baptistery in Ireland. Beside it is an open-air pool with stone seating, and these are all contained within a sunken stone enclosure. The best-known octagonal baptistery in Christian archaeology may be the baptistery in front of the west end of the Duomo in Florence. The octagonal plan that became popular for baptisteries in the Middle Ages, including those in Florence, Ravenna, Milan, Parma, Volterra and Pistoia in Italy and Butrint in Albania, served as a visual metaphor for the number eight, which in Christian numerology symbolised a new beginning. As eight follows the “complete” number, seven, so the beginning of the Christian life follows baptism. Those early baptisteries were roofed with domes, symbolising the heavenly realm towards which the Christian progresses after the first step of baptism. The baptismal font was usually octagonal, set beneath a dome or canopy, and encircled by columns and an ambulatory. These features were first used by the Byzantines when they altered Roman buildings to use as baptisteries. Baptisteries commonly adjoined the atrium, or forecourt, of the church and were often large and richly decorated, such as those at Florence, Pisa and Parma. After the sixth century, baptisteries were gradually reduced to the status of small chapels inside churches. The foundations of the first baptistery of San Giovanni in Florence date from fourth or fifth century, but the present octagonal baptistery in Florence, which is one of the oldest buildings in the city, was built between 1059 and 1128. The octagonal baptistery in the Piazza del Duomo, opposite the Cattedrale di San Zeno, or Cathedral of Saint John, in Pistoia in Tuscany, was built as late as the 14th century. The Baptistery in Florence is renowned for its three sets of bronze doors by Andrea Pisano and Lorenzo Ghiberti – Michelangelo named the east pair of doors “the Gates of Paradise,” and was Dante baptised there. So, the octagonal plan of the baptistery at Saint Doulagh’s, although on a much smaller scale, shows an awareness of and an interaction with Christian practice at the time in southern Europe, both in Italy and throughout the Byzantine realm. So, there is more to the story of Christianity in Ireland than the stories of Saint Patrick and the Celtic monasteries. 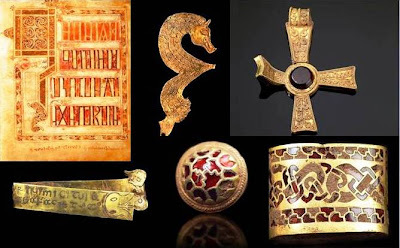 Christianity in Ireland predates Saint Patrick, whoever he may have been, and primitive Christianity in Ireland owes much not only to the Celts, but to the Romans, Vikings, Norman, and many others. The question, instead, ought to be one of how we can name or claim and integrate those identities? What about not just the Celts, Romans, Vikings, Normans, but also those who arrived later from England, Wales and Scotland, the French Huguenots, the later refugees, immigrants and asylum seekers, who also contribute to our Christian Heritage in Ireland today? JR Bartlett and SD Kinsella (eds), Two Thousand Years of Christianity and Ireland (Dublin: Columba Press, 2006). Brendan Bradshaw and Dáire Keogh (eds), Christianity in Ireland, Revisiting the Story (Dublin: Columba, 2002). JK Clarke, ‘The Parish of St Olave,’ Dublin Historical Record (Old Dublin Society) Vol 11, No 4 (September-November, 1950), pp 116-123. Patrick Corish, The Irish Catholic Experience (Dublin: Gill and MacMillan, 1985). Peter Costello, Dublin Churches (Dublin: Gill and Macmillan, 1989). Richard Haworth, ‘The Site of St Olave’s Church, Dublin,’ in John Bradley (ed), Settlement and Society in medieval Ireland: studies presented to FX Martin, osa (Kilkenny, 1988), pp 177-191. John James McGregor, New Picture of Dublin (Dublin: CP Archer, 1821), pp 128-129. William M Mason, The History and Antiquities of the Collegiate and Cathedral Church of St. Patrick (Dublin: 1820). William Roche, Nicky Rossiter, Kevin Hurley, Tomás Hayes, Walk Wexford Ways (Wexford: The Print Shop, 1988). Canon Patrick Comerford is lecturer in Anglicanism, Liturgy and Church History, the Church of Ireland Theological Institute and an Adjunct Assistant Professor in Trinity College Dublin. This lecture in Saint Doulagh’s Church, Balgriffin, on 23 August 2013, was organised by the Friends of Saint Doulagh’s, in association with Fingal County Council, as part of the programme for Heritage Week 2013.